CINCINNATI (AP) Carlos Dunlap knew he couldn’t get to the quarterback, so he threw up his hands. Moments later, the ball settled into them, and the defensive lineman was off for the end zone. A freaky play? Absolutely. It was exactly what the Cincinnati Bengals needed to carry hope forward for another week. Dunlap’s 16-yard interception return in the fourth quarter sent Cincinnati to a 24-23 victory over Indianapolis on Sunday that gave the Bengals (3-4) a temporary reprieve and left the Colts (2-6) wondering what’s next in a season that’s run aground at the halfway point. By contrast, the Colts came away with more questions about how low they will go. They’ve lost three in a row for the first time since 2015. 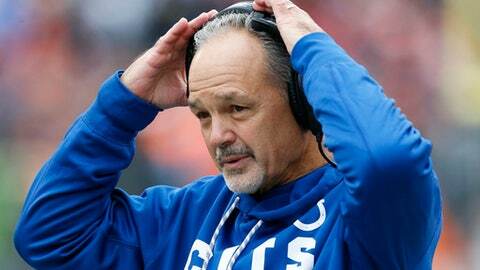 Coach Chuck Pagano’s future in Indianapolis has become a topic of conversation. The Colts have no idea when Andrew Luck might be back from shoulder surgery. He had to stop throwing earlier this month after a setback in his rehabilitation program. Backup Jacoby Brissett played much better on Sunday, throwing a pair of touchdown passes and getting the Colts in position for a rejuvenating road win. His sideline throw in the fourth quarter was batted by Dunlap, who then plucked the ball from the air and returned Brissett’s only interception in the past three games. The 6-foot-6 defensive end led NFL linemen in batting passes away last season, when he made the Pro Bowl for the second straight season. The Colts had a chance at the end, reaching midfield before Brissett was hit on a fourth-down pass that fell incomplete. GETTING A JUMP: Coach Marvin Lewis got on Dunlap earlier in the game for easing up and trying to knock down a pass instead of going after Brissett. Dunlap was second on the team with eight sacks last season, and the Bengals think he could get more if he goes after the quarterback instead of stopping to raise his arms. BENGALS’ INADEQUATE OFFENSE: Dalton was frequently chased from the pocket as Cincinnati’s offensive line struggled to give the quarterback time. Also, Cincinnati rushed for only 58 yards, which included Dalton’s 10 yards on scrambles and receiver Alex Erickson’s 14-yard run. In a 29-14 loss at Pittsburgh the previous game, the Bengals managed only one first down and 19 yards in the second half as the line also got overwhelmed. BRISSETT HAS MORE TIME: After the quarterback was sacked 10 times and hit 20 times overall during a 27-0 loss to Jacksonville a week ago, receiver T.Y. Hilton said the line had to do a better job protecting Brissett. Hilton later apologized. The line did much better against the Bengals, giving up four sacks. Brissett was 25 of 39 for 233 yards with two touchdowns and the tipped interception. DOYLE’S BIG GAME: The Bengals clamped down on Hilton, who was targeted seven times but managed only two catches for 15 yards. Tight end Jack Doyle wound up with 12 catches for 121 yards and a touchdown, taking advantage of the Bengals’ coverage. VINATIERI NO. 2: Adam Vinatieri had three field goals and was hoping for a chance to try for his 28th game-winning kick in the final minute, but the Colts couldn’t get close enough. Vinatieri moved into a tie with Gary Anderson for second-most points in NFL history with 2,434.